Some years ago, I got a call from NFL Films, from a man named Steve Sabol. Yes, he realized I was English by birth and might not know much about American football. So I explained to him that I had arrived in San Francisco in September 1981 at the start of the season in which the 49ers won their first Super Bowl—their first of five. Mr. Sabol was encouraged, but he had called me because he’d read some writing about movies that I had done. I believe I had compared Joe Montana and Gary Cooper in the way they gazed at space. That was his kind of dream. Sabol was himself a movie buff and proud of the work made by NFL Films. In a quiet way, he said he was aiming for something lasting and dramatic, something that affected America. He wanted to make a movie about football and film. He came to interview me, and I think I was a little amused by this assignment—until I saw how his crew were working. I had been interviewed quite a lot for movies and videotape was the standard. But Sabol’s team had magazines of film. I remarked on this, and he said, “Oh yes, I told you, we’re serious.” And I felt honored. Steve Sabol died of a brain tumor on September 18th. He was only 69, and just a week earlier, his father, Ed, had died at 96. The father had founded NFL Films, in 1962, given his art-student son a camera, and watched as the enterprise became a dominant room in the house of sports on television. 1962 saw the death of Marilyn Monroe and the Cuban Missile crisis, The Manchurian Candidate and the first James Bond film. It seemed nail-bitingly up-to-date at the time, but so much has changed in fifty years. Ed Sabol got the TV rights to the 1962 NFL championship game for $4,000. The Super Bowl was still a few years ahead, and surely television coverage hastened it. The face mask had only been invented in 1955. The helmets began to promise fighter-pilot heroes or astronauts. Football was being sold and it would become a massive industry. 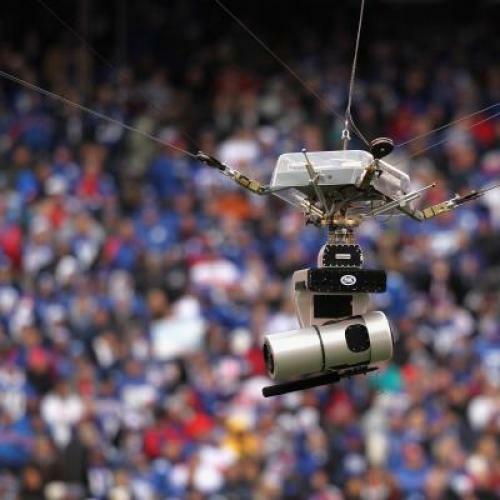 The networks now pay $20 billion a year to the NFL for the right to broadcast games live. NFL Films was a property of the NFL, with seed money from all the teams. Then later it would be hired by ESPN. Its task was to cover all games, promotion, and documentary needs apart from the live broadcasts. In addition to those services, and because of its use of film, it became an archive. It showed match of the week highlights, and it cultivated a desire in fans for nostalgia by showing old games. But much more than that, it grew out of an attitude—shaped by the American action movie—that football was intensely combative, fast, skilled, strategic, courageous, romantic and dramatic. All of these qualities were delivered in the superbly repressed melodrama in the voice of their favorite narrator, John Facenda, who became the spirit of the NFL. George Will’s observation that American football is “violence, interrupted by committee meetings” is itself an expression of TV coverage and the way that restructured the game, not just with timeouts, but with prolonged replays to scrutinize the nature of physical reality. Sabol put the poet and the philosopher on the same sofa. Slow-motion replays allowed the connoisseur to study detailed action (and fouls) in the trenches, as well as the intricacies of pass interference and holding. Players learned how to play better because of those lessons, and they began to acquire celebratory routines that would have been thought shameful before 1939, but which are taken for granted now. The sport of football went from being an athletic contest (and a college game) to being a television event. We discovered the bravura bravado of Howard Cosell. For the Super Bowl nowadays there are thirty cameras covering the action. Is there any human activity that is more thoroughly recorded? You don’t have to approve of football, or accept that it is just sport. As a business, from a regular season that has sixteen games per season, it has twice the annual revenue of movie-going. As a sport, it is increasingly beset by fears of brain damage, and of the legal consequences flowing from that. Just recently, the suspicion has surfaced that the violence may have been organized and employed beyond the natural physical contact of the game. In thirty years John Madden has gone from being an eccentric but successful coach to an idiosyncratic but very influential television commentator to a video game that is really just another version of the warfare that prevails in that medium. Madden never sounded like John Facenda, and I suspect Madden the game chilled Steve Sabol. Sabol had played football himself, at Colorado College, and it was evident in a short meeting that he revered the game. The way he could share his sense of it with the American public was akin to the way certain movie directors.—Ford, Hawks, Sturges, or Capra—could address America, its ideals, its success and failure. Football was and is a real event, but Steve Sabol happily entered into the process of making it a myth and a legend. The music he used was movie-like. Facenda spoke like someone recounting the heroics of a past age. I suppose it would be possible to film football in other ways—with the bleak detachment of a Frederick Wiseman, with the hallowed air of Ken Burns, or as an absurd rite of violence and cruelty (Werner Herzog might be the man for that—though soccer was his game). But a good game of football—by which I mean a close contest between talented sides, with such smart commentators as Al Michaels or Jon Gruden, and with the elasticity of cameras that permits an intimacy not possible at the game itself—is one of our great entertainments. We abide by the hope that it is uncorrupted by organization or arrangement—in short, by money. We still cling to the ideal of honest competition, and we prefer not to notice that it is some white Americans' chief exposure to black men and to the glamour of obesity. Steve Sabol served the NFL, of course, and he is in part responsible for the way television has commandeered the game. The cameras still record, but they are so much more intent on celebration. The gap in trust widens as it does everywhere nowadays when American idealism is split apart by its commercial compromises.